Hopefully this series is assisting, in some small way to encourage turners to broaden their scope of work and gain greater satisfaction from the craft - if so, it is meeting its objective. By now the work in this series has already spoken for itself as to why self-made tooling is important, and what a significant role it can play in achieving higher, more satisfying standards and results. 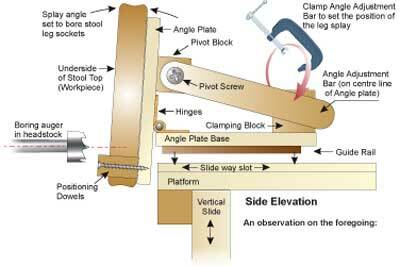 In this, the third part of 'drilling on the lathe,' I want to add some emphasis to the importance of self-made tooling by developing a design idea to construct a self-made universal lathe jig, or to be more precise, a universal jig frame, or base on which a number of work positioning sub-jigs can be mounted. Perhaps at first, reading this might sound a bit complicated and not of any direct use in the projects you are currently planning. However, the principle behind the universal jig is to provide a vehicle, or platform, that puts you in a position to quickly and easily add a wide variety of devices in the future as your project needs arise. 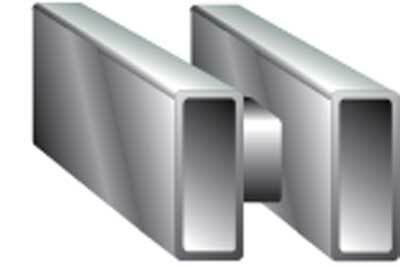 This design is intended for use on a twin bed bar (or tube), or flat bed lathes (see Figures 1a, 1b and 1c). The designed centre height of 150mm (6in) from the bed was chosen so that the important height measurements for other lathes can easily be established. 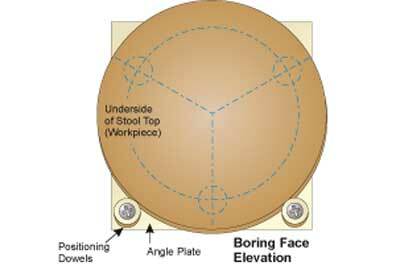 For example, a 200mm (8in) centre height would allow a further 50mm (2in) to be added to the vertical table position. See component dimensions for more details. 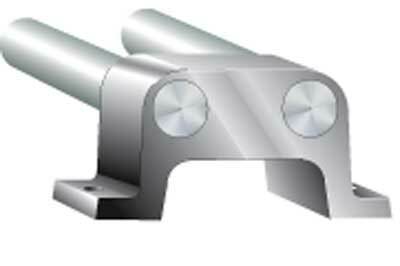 Because lathes are not designed to a set standard, it is not possible to produce a fully dimensioned set of drawings. 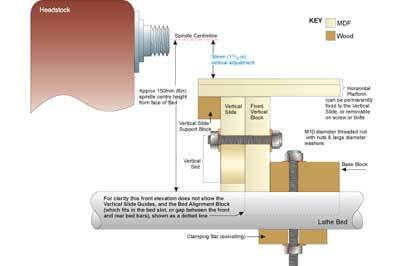 However, apart from some guidance on material thicknesses and a few dimensions for the vertical positioning, the other dimensions are relatively unimportant, and are easily determined by measuring, or fitting the various components to your particular lathe. 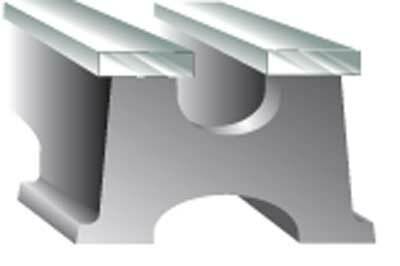 Fixed vertical block dimensions for a 200mm (8in) centre height lathe: overall height = 124mm (5in) M10 hole centre height = 78mm (3 1/16in). 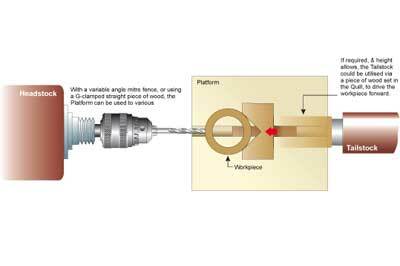 For larger lathes, increase both dimensions by between a quarter to a half of the additional centre height. The fixed vertical block and the vertical slide is best made from a single-sawn strip of 25mm (1in) MDF. The vertical slide will only then require easing to allow it to slide without the slackness between the rear and front slides. Also, if a sufficient length of MDF is cut, then additional vertical slides can also be made for other more specialised applications. 1. Cutting and sanding MDF does present a particular dust hazard and therefore, a dust mask must be worn. 2. Whilst MDF is very strong, it has an unfortunate tendency to delaminate when screwing into the edges. 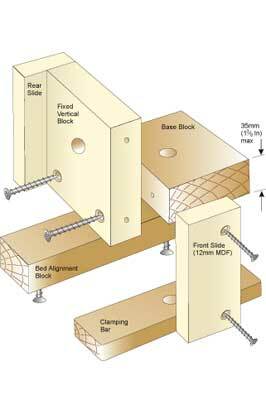 To counteract this, drill pilot holes into the receiving MDF component and clamp the board firmly either side of where the screw is penetrating. 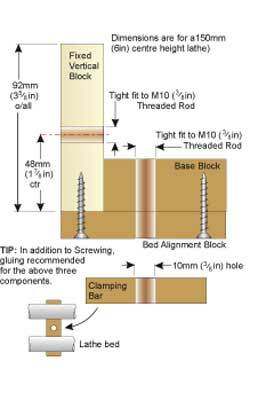 As an alternative, a steel mount (for those with metal working facilities) along the lines shown below may be considered. It is understood that a commercial version may be available soon. Watch out in the magazine and we will bring news of new product details when they arrive. The surface area on the platform can be any size you choose, always remembering that the bigger it is, the more easily it can be distorted in use. For most operations this is not serious, but worth keeping in mind. 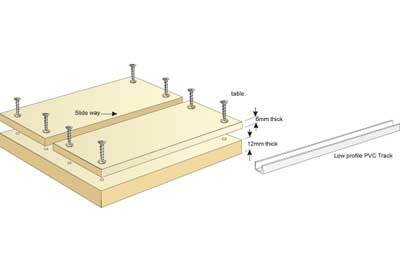 The proposed construction of an 18mm thick MDF platform consists of layers with screws and glue together, but you can vary the platform design to suit your individual needs, and of course, make the platform demountable, so it can accommodate a variety of guides and uses, such as a sanding table. Hence, the holes to mount the platform onto the vertical slide are not shown. 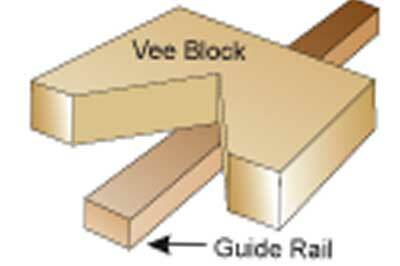 The simple horizontal 90 degree 'vee' block illustrated here involves a hardwood guide rail glued and screwed to the block, which needs to be made and set as equally as possible. This is quite easy to set correctly with a tri-square if the block is formed equally. 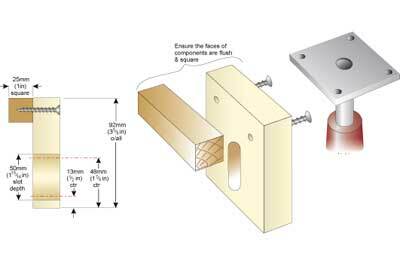 If using the mitre fence from another machine, then the 'vee' block part will be required. These examples are simply to provide ideas that may be of help in future projects. Even if the idea of having such a platform does not appeal to you at the moment, hopefully this article, in conjunction with other Fundamentals articles, will at least add to your understanding of the benefits of jigs and fixtures in woodturning, albeit in a totally different area in the craft.